A gruesome scene played itself out at the 1004 housing estate in Victoria Island, Lagos on Friday, February 10, 2012, as Lagos club owner Susan Yusuf was stabbed by a man believed to be her boyfriend Idris. Estate security this morning confirmed Susan’s death, saying the shocking event occurred at about 9:30PM. Apparently, the night club owner screamed for help when things took a violent turn with Idris, who sources claim is a regular visitor to her residence, but not even her neighbour, popular Mo’Hits singer Wande Coal, could come to her aid, as the music in his apartment was allegedly quite loud. NEWSMEN investigations revealed that the couple had been indoors all evening, when all of a sudden, an argument ensued, leading to Idris repeatedly stabbing Suzy with a bread knife. The deceased lived in flat 606 in block D5. ‘She was shouting Wande’s name but the music as usual was too loud for him to hear’, one resident said. Wande Coal was unreachable at the time of this report; we however saw General Pype walk past flat 606 and enter a nearby apartment. Another resident claims when Wande found out what was going on, he tried to intervene. When residents tried to apprehend him, Idris reportedly jumped from the 6th floor, dying on impact. ‘The guy is her boyfriend. He usually comes and sleeps over, buys groceries and rides her car’, another resident told us. She died in the elevator while neighbours were trying to get her to the hospital. An eye witness tells us she was bleeding and holding on to her sides as she bled out, but gave up the ghost soon after. ‘Suzy doesn’t really stay at home around that time. We are all still surprised why she was at home at that time, knowing she leaves the house around 5 or 6PM and returns at about 7AM in the morning’, a security guard who would rather remain anonymous tells us. ‘This is a very very sad situation’ said one resident. ‘The whole estate is beyond shocked, the manner of violence is unbelievable’. Both bodies have been taken to the mortuary. When we visited the 1004 Apartments this morning, normal activities in the estate had resumed. The Nigerian Police Force from the Bar Beach police division have however paid a visit to the murder scene and obtained the key to the late club owner’s Prado Jeep (license number CP630-AKD). Upon questioning, the Police remained mum. ‘Please get in touch with our P.R.O’, an officer who refused to disclose his name told NET. We later saw them pumping the deflated tyres of the deceased’s Prado Jeep. We’re told the jeep will be taken over to the station. 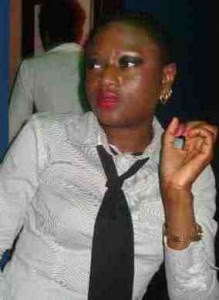 Ms. Yusuf was the owner of SQ Lounge, a Lagos-based night club. The club was briefly renamed Club Jonzing last year, following a partnership with pop star D’Prince. Her close friends say prior to yesterday’s tragic event, she was planning a ‘Table for two’ Valentine’s Day dinner at SQ Lounge. Her flat has now been sealed off by the police. We have just visited SQ Lounge. The atmosphere, expectedly, sober and the property is under lock and key. But NEWSMEN was able to get info from security staff who say the deceased was at the club yesterday. We’re told she stopped by briefly,then left for home, telling her staff she would be back. ‘Madam and Idris were like 5 and 6. They would drive each other’s cars. They still had lunch together here on Thursday’, a security staff tells us. Another source says Suzy’s relatives have been contacted but are reluctant to come see her. We were also reliably informed that her body was rejected by several hospitals when they rushed her there.